.A team containing 60 chefs, headed by Vinoth Kumar who is a five-time world record holder, made a 100-foot-long dosa on the IIT-Madras campus on Friday. Previously, Hotel Daspalla, Ahmedabad, held the record for longest dosa to be made in the world, according to an official release. The dosa measured 16.68 metre (54 feet 8.69 inches), and the feat was performed in 2014. The 100-foot-dosa was prepared by using 37.5kg of batter. As much as 10kg of rice flour, two kilograms chickpeas along with other essential ingredients had been used to make the dosa, the release added. 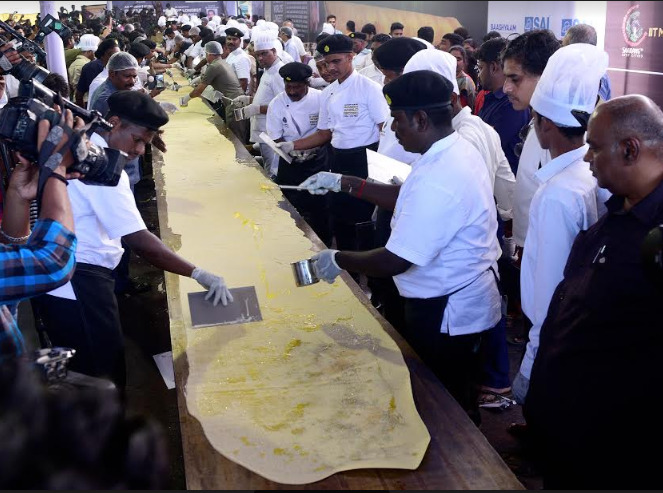 Chef Vinoth said the dosa had been made on a 105-foot pan specially made for the purpose in coordination with the engineering team of Saravana Bhavan. The pan had been maintained at the temperature of 180-200 degrees Celsius to ensure that the dosa batter would not set immediately, he added. How did they flip the dosa - if they did really flip it? How did they remove it from the so called pan in one piece?? Who uses chickpeas for making dosa??? Dōsās are NOT flipped in restaurants! Chickpeas give golden colour to dōsā! I use moong dhal instead. I do not these techniques and theories behind these techniques since I hardly ever go or get to go to a restaurant. I always think of dosai as soft, round and white as the full moon. yes madam , you are right. neither they are flipped nor they pour oil around it. Instead they sprinkle oil on top of dosa. ok tell me they add sugar to batter before pouring it on tawa, is it true?? I do not KNOW these techniques and theories behind these techniques since I hardly ever go or get to go to a restaurant. Oil is not poured, but spread using a tiny broom!! Hope it was NOT used elsewhere before entering the restaurant kitchen!! No idea about added sugar! P S: I add a teaspoon of sugar when I grind 'maruthāNi', to make it sticky! Wow! Now the typed message is auto-saved in mobile phone also! Good job by the administration! I think such culinary practices must be discouraged. May be its record to some, pleasure to some, curious to some etc. But what I see is total unhygenic conditions, full of microbes. These are potential health hazards and I hope the health dept looks into it. but I find people ask for murugal or paper roast correction please!! by the way in the new system how to edit?? when she bit it with her tiny teeth! and NOT the one 'which remained silent and serious'! I have seen one grown up adult in the most repulsive way. He would roll the entire dosai and start pushing it in his mouth and down his throat - trying to swallow it whole like a python. The part of the dosa dangling from his mouth - like a half eaten animal out of the mouth of a T Rex - is enough to make any onlooker want to throw up. Many Qs answered in this video !!! So, no one can scold and edit later. One member was a specialist in this! Mail in the inbox will show the original!! gets bold letters, smilies and colours!!! I was of the impression that Gunnies awards are for achievements. In this case the Gunnies award should go to the person who eats this Dosa fully, within a stipulated time. Hotel Saravana Bhavan can initiate the competition under the supervision of Gunnies people. What else can we expect from HSB people? The next may be 100 kg idli! !